Our SeniorLife Communities offer a full continuum of care with independent living, assisted living, and nursing care. It’s a structure most recognize as a continuing care retirement community (CCRC) or life plan community. However, we often wonder why it’s called “retirement.” The senior population is such an active one — you travel, volunteer, work, serve in community leadership roles, and share lifetimes of wisdom and knowledge. At Otterbein, we don’t see any reason why that should stop after you move in. You’ll find endless outlets for your energies, have an opportunity to make new friends, and enjoy a lively, active community. When it comes to comfort and security, all six of our SeniorLife Communities offer a wide choice of houses, apartments, and assisted living — with friendly, compassionate, care as you need it. 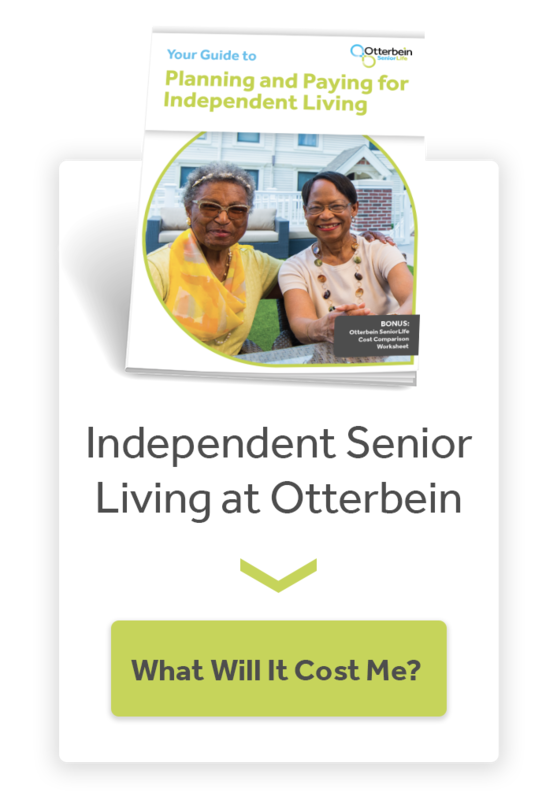 If you live in Ohio, you’re not far from our Otterbein SeniorLife Communities. Explore our communities online below and schedule a tour to see them for yourself. If you live at one of our six SeniorLife Communities, our wellness services may be available to you. We offer a variety of services from personal care and companionship to routine wellness checks and skilled nursing care. Rest assured that all the individuals providing services are our very own trusted Otterbein staff. The charges for these services remain reasonable because we want to make them accessible. For example, skilled nurse services can be requested by the hour, or by 15-minute intervals. Why pay for more than you need? Senior living at Cridersville offers a wonderful town-and-country lifestyle. Enjoy relaxing wooded hills and lakes, with plenty of opportunities to get inspired by arts, culture, socializing, and sight-seeing. Live life at your own pace at our Franklin community, with an invigorating atmosphere and a host of amenities and services. Rest assured, all your current and future needs will be met. The Lebanon location offers a vibrant community with unlimited choices to create your ideal lifestyle. The campus hums with activity, from the life enrichment center to the nearby lake and golf course. Experience life in a caring community on Lake Erie’s scenic shore. Every step leads to something interesting, whether that be on campus, in town, or on the water. Pemberville offers community members a peaceful valley that’s located conveniently near lively attractions. Relax on the friendly, shady campus or head for Toledo to enjoy all the city has to offer. Are you someone who enjoys laid-back lakeside living with a healthy mix of active outdoor pursuits? From sunrise to sunset on the lake, each day offers the active lifestyle you’ve been dreaming of.